Are your students starting to read chapter books? If so, it is time to introduce them to Magic Tree House books and watch as they quickly become engaged! Magic Tree House books are fantastic beginning chapter books because they have likeable characters, enjoyable adventures, and a predicable format. Not to mention they have sprinklings of historical/scientific facts throughout that students find interesting. As a teacher, one of the things I like about the series is that after students meet Jack and Annie in the first book (Dinosaurs Before Dark) they can jump around the series reading the ones that peek their interest the most. The books do not have to be read in sequential order! 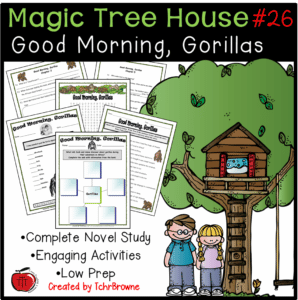 I usually have at least one of my guided reading groups reading a Magic Tree House book because they are a great way to introduce plot, characters, setting, and problem and solutions. The novels are also great for teaching many reading strategies such as connecting, predicting, and questioning. While we are reading the novels we discuss story elements and work through a novel study package to focus on comprehension. Here is a FREE one for you to try out! 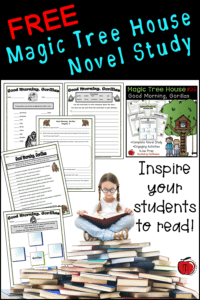 I have many different Magic Tree House novel studies that I have created for my students and you can get a FREE copy of one to try out. 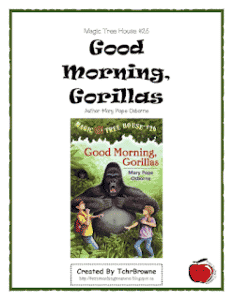 This one is for book #26 Good Morning, Gorillas! I guarantee your students will be as excited about learning about the African rain forest and gorillas, as mine are! In this LOW PREP novel study you will get comprehension questions for every chapter. The questions come in 2 different formats: 1 has lines for your students to write the answers on and the other has just the questions so students can respond in a notebook. 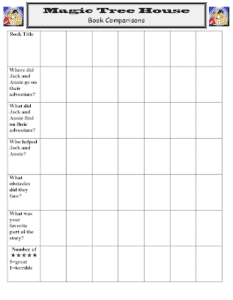 Also included are 5 additional activity pages to further engage your students. A true or false statement page which has students analyzing events of the story. An alphabetical order page filled with vocabulary from the story. A sentence writing activity where students take vocabulary from the novel to write proper sentences. A fun word search filled with story vocabulary. And my FAVOURITE– a web chart for students to record/research facts about gorillas. How can you get this FREE novel study? Well that is the easy part!!! Just click on any of the pictures or right here and you will be able to download your copy today. I know your time is valuable so there is hardly any prep — just print, staple, and hand out. Want another free activity to add to the novel study? Check out this FREE story connections page which you can add to any part of your novel study or have students complete it at the end.